Board index ‹ Passenger Rail ‹ Canadian Passenger Operations: AMT, Go Transit, VIA, etc. Hey there - yesterday I booked my first trip on The Canadian - Vancouver-Toronto in late May in a bedroom. I've wanted to travel this train since I was a kid and I'm super excited to celebrate a milestone birthday while doing it. - I'm currently booked into car 212 - does anyone know what their standard numbering system is, and what a typical consist would be like at this time of year? I have a general understanding of past consists but any current info would be appreciated. - Any tips for requesting specific bedrooms / cars? - How crowded will the domes be at this time of year? I'm guessing the Park car will be cordoned off for Prestige class passengers for much of the time. Despite the often late-running, the Canadian is a splendid train. This past year's Vancouver - Toronto trip was my 50th anniversary of my first trip on the train. Of course, it was run by the CPR at that time. In the summer season the first sleeper is 210, so your car 212 will be the third if VIA doesn't change the order. Sometimes VIA puts the first dining car behind car 212, but last year it was ahead of car 210. In the off-peak, car 210 is the last one ahead of the diner and the numbers go forward. In th summer season there are usually a few extra sleepers operated between Vancouver and Edmonton and they are placed ahead of car 210. VIA has been known to make changes, however, and people who think they are near the back of the train find themselves near the front and v.v. So nothing is for certain. You mention you are travelling in a bedroom. Would that be a "cabin for 2" as it is now called - the traditional term was bedroom - or the "cabin for 1" previously known as a single bedroom and before that a roomette? If you are taking a "cabin for 2" the biggest one in every Manor sleeper is "F". It is 18 inches longer than the other rooms and there is no longer a surcharge for it. Naturally, the regular passengers know this so it can be difficult to get a bedroom "F". In peak season (normally the end of April until mid-October) the Park car is for Prestige passengers only until 4:00 p.m. But each dining car is paired with a Skyline car. The snacks and coffee, tea and hot chocolate are available in those cars as in the Park car. There are several people on this forum who have taken the Canadian and we will all be pleased to share our experiences and answer any questions. And please share your experience when the time comes, as VIA will be operating on a new schedule when that time comes. So it would be interesting to hear observations! Pictures especially appreciated! Also, since this is peak period, they will add the Panorama Car (single level full length car with wrap around glass windows) between Edmonton and Vancouver. I haven't ridden during peak period since Prestige has come on. I would still think the view is superior from the Skyline Dome car, but just in case, know that a seat here for anyone in sleeper is also an option. VIA has three of these Panorama Cars, two operate on the Canadian in peak season, and one on the train to Prince Rupert (certain days of the week, not each train due to being one car short). Used to be that all three operated on the train to Prince Rupert, which I thought was the better of the trains to have these cars on. Thanks for your responses - I was able to change my bedroom to F - great insider info! I've slept in the stainless steel equipment many times on The Ocean in years past, but usually in a roomette or section, and The Ocean typically had only Chateau sleepers - I'm not sure if they have the same extra space in the last room. As an aside, does anyone know what happened to all those cars since The Ocean switched to mostly Renaissance equipment? I note Via doesn't advertise a drawing room (bedroom for 3) on The Canadian so it doesn't appear the Chateau cars are in use on that route, either. The Chateau sleepers have drawing room A, then double rooms B, C and D. Presently VIA is operating one of the two consists of the Ocean with Budd equipment. They did that last winter. Photos and consists of the train over the Christmas holiday season showed a mixture of Chateau and Manor sleepers. VIA converted eight Chateau sleepers to Prestige cars. One or two are used on each of the Churchill trains. In peak season one is operated on the Ocean and year-round on the Canadian for the crew. As there are no extra Manor sleepers in peak season (not even one spare to cover bad-orders) the Chateau sleepers are used when more sleepers are necessary. Many of the ones I have walked through are shabby and have a musty smell. VIA said in their last "annual public meeting" that the Chateau sleepers will not be refurbished like the Manor sleepers were, which is a pity. Thanks for that info. I guess they're storing the chateau cars for a rainy day or to strip them for parts. I consulted my dusty old Rail Canada Volume 4 - it has the dimensions of all the cars Via had in the early 80s. You can see the measurements on the details below. chriskay wrote: Thanks for that info. I guess they're storing the chateau cars for a rainy day or to strip them for parts. The CPR called them Compartments as opposed to Bedrooms because there was a higher charge for them. There were three chairs in "F" as opposed to two in the other bedrooms. In the early 1970s they stopped charging extra so they were called Bedrooms and the third chair was removed. VIA, in the 1990s I believe, started to call "F" a Master Bedroom and had a 10% surcharge. After about a year the surcharge was dropped. I have seen those diagrams before and there is an obvious error in the measurement of room "F". It shows it a mere 5 mm longer than the other bedrooms. I have measured it and it is 18 inches, which is 457 mm. There is an obvious error in the measurement of Bedroom "B" in the Chateau sleepers. It shows it as being 456 mm (approx. 18 inches) longer than the other bedrooms. I have not measured it, but have occupied all rooms in all sleepers and there is no way it is noticeably larger. I wish I could find diagrams with the original measurements which would likely be in inches. Thanks for those corrections - I've pencilled them in for future reference. Also super interesting about the "compartment" naming and the reason behind it - thanks for sharing that info. I too am taking the Canadian in May. I’m booked in car 111 in a cabin for 1 from Toronto to Vancouver. What I’m concerned about is the carry on baggage allowance. You’re apparently allowed two pieces of luggage and a personal item. But the dimensions given are considerably smaller than typical carry on bags. One of my bags is a moderately sized suitcase on wheels that easily fits in an airline overhead bin. The other is a bag with carry straps that fits under an airline seat. I always carry the same two bags on board when I fly. I’ve never been told either one is too big or needs to be checked. But I just measured them and they both exceed the dimensions allowed by VIA. (It’s the one 9” dimension that’s the problem.) So I have two questions. 1. How strict or nit picky is Via regarding their maximum dimensions? 2. If they’re not very strict and I brought my usual two bags on board, will I have any trouble stowing them in my cabin? I don’t want to check either of them if possible. Btw, I frequently travel with both these bags on AMTRAK, in roomettes, and both fit quite comfortably. I’d really appreciate any feedback. Thanks so much! I usually travel with an airline-size carry-on rolling case and one other smaller bag - a "personal" bag as it is often called. There is no problem with a Manor sleeper's cabin for 1 (roomette). The larger bag will fit on the overhead shelf and the smaller one can go under the seat. Ok, so I decided to upgrade to a cabin for 2 and have a bit more space. I asked the phone rep if they had an F cabin available. He said no but that cabin A is also a larger one. So I booked it in A and after the call I looked at the layout of the cabin. If I’m looking at it correctly, it appears that roughly 1/3 of the window extends past the bathroom wall, unlike the other cabins. So I switched to cabin E figuring I rather have a full view out the window than some extra space. Am I correct about the layout or did I screw up? Trained wrote: Ok, so I decided to upgrade to a cabin for 2 and have a bit more space. I asked the phone rep if they had an F cabin available. He said no but that cabin A is also a larger one. So I booked it in A and after the call I looked at the layout of the cabin. If I’m looking at it correctly, it appears that roughly 1/3 of the window extends past the bathroom wall, unlike the other cabins. So I switched to cabin E figuring I rather have a full view out the window than some extra space. Am I correct about the layout or did I screw up? Is it Cabin A in a Manor? Because if so, it's no bigger than any of the other rooms (A and E would be essentially identical, though E being closer to the centre of the car may be a slightly smoother ride). F is the only exception. By contrast, Cabin A in a Chateau, when there's one in use, is actually a drawing room (or "Cabin for 3") and it's a much larger room - if an agent was willing to move you there and still count it as a bedroom, then you'd definitely want to take that. As for the window location, I'm fairly certain that is a quirk of the diagram - the window should be fully in the room just like any of the others. There's a few little things on the diagrams that aren't quite right (e.g. it shows the window on the Chateau drawing room as being the same size as the others, when it's actually much larger, shows a window by the shower where there no longer is one, etc. ), so don't take them too literally. timberley wrote: As for the window location, I'm fairly certain that is a quirk of the diagram - the window should be fully in the room just like any of the others. There's a few little things on the diagrams that aren't quite right (e.g. it shows the window on the Chateau drawing room as being the same size as the others, when it's actually much larger, shows a window by the shower where there no longer is one, etc. ), so don't take them too literally. Then why post drawings for passengers to make choices from that can't be taken literally, verbatim? While most potential passengers may not care how accurate these drawings are, obviously some do. VIA should provide accurate up-to-date drawings on its web site as a public service. We should not be relying upon drawings made in the 1950s. I think such a proposal is unlikely to happen. Imagine the repercussions if rooms have to change for operational reasons and someone complaining about a few millimetres. Let's keep such detailed technical info for folks like us who love this sort of thing. 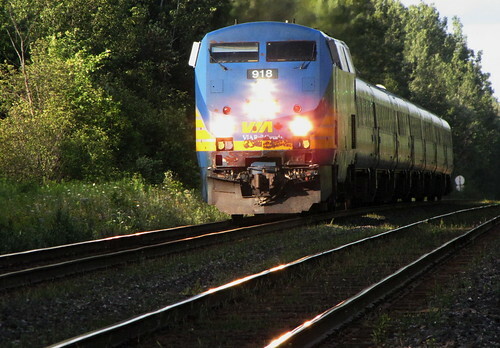 Return to Canadian Passenger Operations: AMT, Go Transit, VIA, etc.